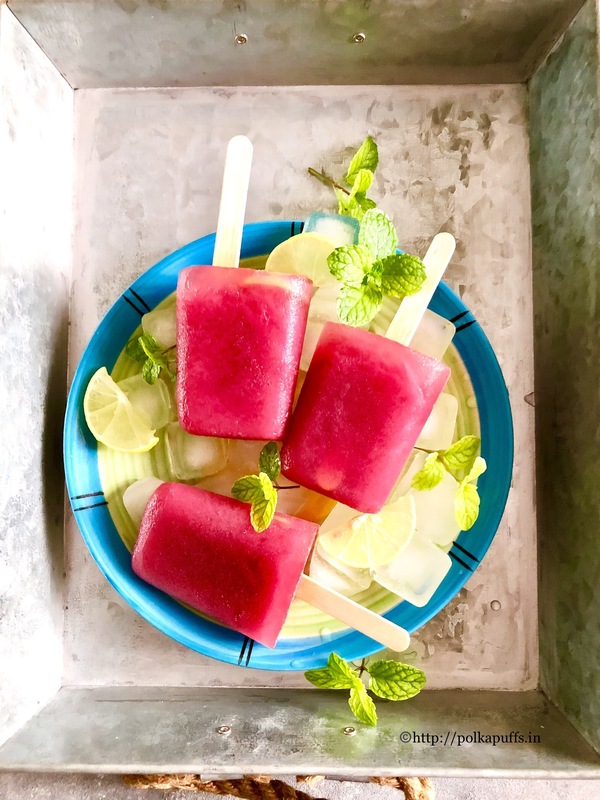 Kala Khatta Popsicles | Jamun Popsicles | Indian Java Plum Popsicles are made from scratch and I have flavored them with lots of fresh spices and lemon juice. They taste just like the ones I’ve enjoyed at Juhu beach all these years. Kala Khatta is my favorite flavor, hands down when I’m thinking of ‘gola‘ or ‘chuski‘ (Indian popsicles). I can probably have 2-3 at one go and still long for more, hahah!! Although, a mixed flavored gola is just as good with a ton of spice powder/ Chaat masala sprinkled all over!! I’m salivating just as I type this draft, lol!! Kala Khatta can be made easily at home with fresh Jamun/ Indian Java Plum fruits. They are available in plenty around this time in Indian, that is the end of May through mid June. Yes, they are available for a really short time and I make the most of this time! You must try my Jamun Panna / Java Plum cooler. Wash the jamuns. Wash a handful of mint leaves. Season the boiling water with salt. Add sugar, mint leaves and the jamuns. Let them boil together until the jamuns become mushy and soft. Turn off the flame, let this concoction come to room temperature. Sieve the concoction and collect the puree in a bowl. Discard the mint leaves along with the jamun seeds and leftover peels, etc. Add lemon juice, kala namak, roasted cumin powder, chaat masala to the pulp. You can add more sugar if needed as per your taste. Pour this mixture into popsicle moulds and add an ice cream stick. Set them in the refrigerator for 7-8 hours to let them set. Once set, unmould and enjoy. 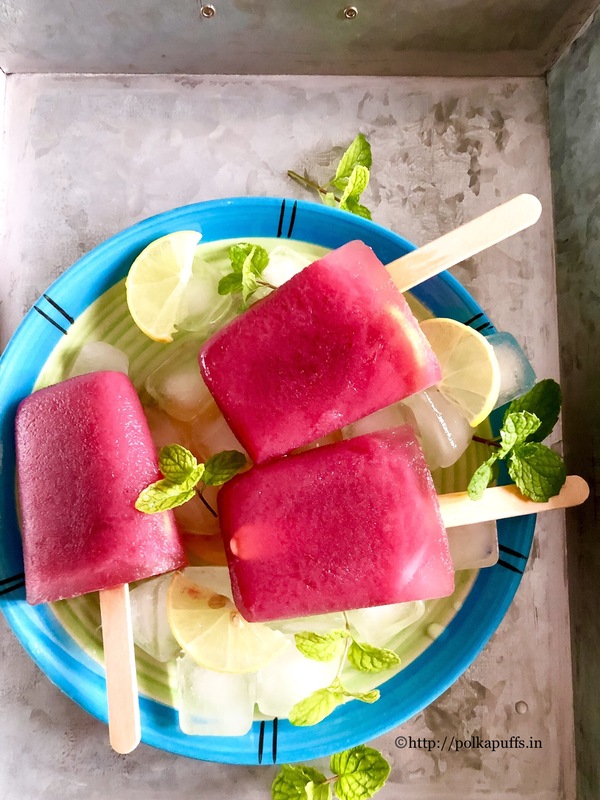 Sweet, slightly sour and a tad bit spicy Indian Java Plum/ Jamun Popsicles are so delicious and very refreshing during the sunny days! 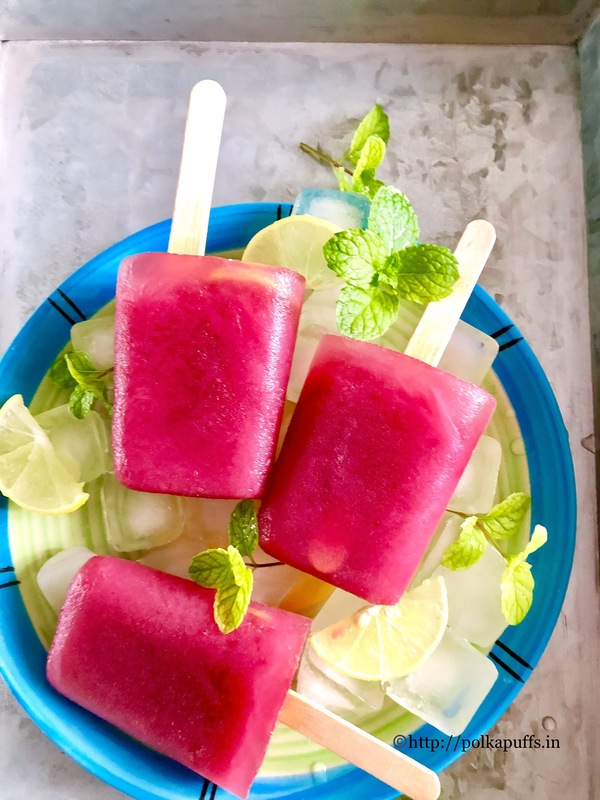 These are the best Kala Khatta Popsicles one can make at home with just a few basic pantry essentials.